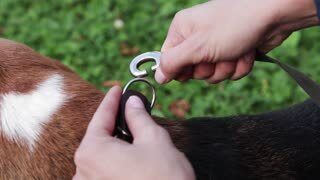 Fastening the leash to the dog's collar. 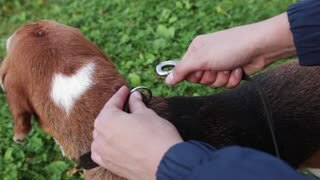 Preparing for a walk with the dog. Woman walks on bridge with her dog on leash. Small yorkshire terrier runs near owner on snow. Slow motion. Woman walks on bridge with little dog. Small yorkshire terrier on leash runs near owner in a winter snow-covered park. Slow motion.